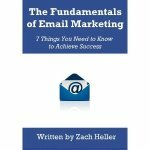 Last year I first published my book, The Fundamentals of Email Marketing: 7 Things You Need to Know to Achieve Success. Thus far, I’ve been more than thrilled with the response and feedback that I’ve gotten. And today, I’m proud to announce that you can get a free PDF copy. Email me at ztheller(AT)gmail(DOT)com with the subject line “Free Book”. That’s it. Do this all within the next week and I’ll respond to your email with the PDF. Yours to keep forever. The deadline is October 17th.